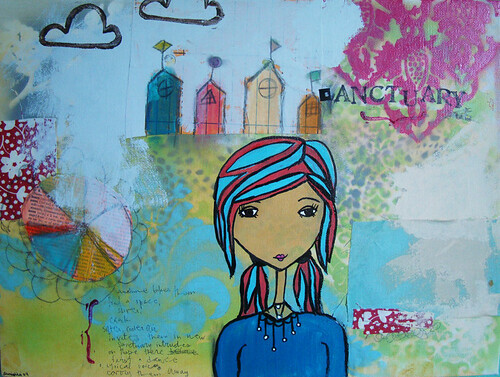 Starting this month, I’ll be running a monthly mixed-media class. I’ll be teaching projects and techniques at a lovely little studio space near downtown Phoenix, and we’ll have a yummy dinner & dessert to enjoy while we’re creating! I am so very excited to show you November’s project — a magic box! I wanted us to create things that could be given as gifts or help us record the upcoming holiday season for the next two months, and became enchanted by the magic of nature and wishes and boxes combined! The process of creating this box was brilliant! I know we talk about the transformative power of creating art, but it is one thing to read the words and another to experience them. My new awakening has me out in nature, more, reconnecting to my roots. I want to stand in the grass and soak in the energy of the Mother. I want to jump in pile of leaves (in dreams, as there are not enough leaves here to create a pile). I want to pull nature into my daily life and art, and I learned that through creating this piece. I also began working with clay. As a child, my mother was an amazing clay artist, using found objects and her own hands to craft faces and shapes and little creatures. Textures for skirts and faerie wings. I’ve missed that, and became inspired to add clay to my box. And then there is a bit of collage. Washi tape. Paint. Crayons and marks and scallops. Stamps. But my love is the bundle of twigs, held together with wire and findings, old seam binding from my grandmother’s stash. The wire loops down through the lid of the box to create a handle with which to open your box of magic. Of photos. Of books. Of memories. Of wishes for the future, dreams you hope to come true. I am so excited, I’m going to create more! More and more! You can come with and make one, too! I’ll be teaching the first class of my new monthly shindig on Tuesday, November 20, 2012, at 6PM. It will be held at Spread the Weird Studio down near 7th Street & Roosevelt, right along Roosevelt Row and all those galleries and shops! Cost is $30. Part of the cost goes towards yummy food. Please bring your own cigar box (or you will be able to grab one at class for a small fee). This class is organized by me and Denise of the Make Stuff Club meetup. You can either pay via PayPal with the link below, or call me to pay over the phone. Please note that space is limited! I really hope to see you there! I want this monthly meetup to be full of art, fun, and new discoveries. I've had some pretty nice things said about my various projects lately! Samantha refers to this as a "gentle hug"...I call it a great, big, comforting mama bear hug! 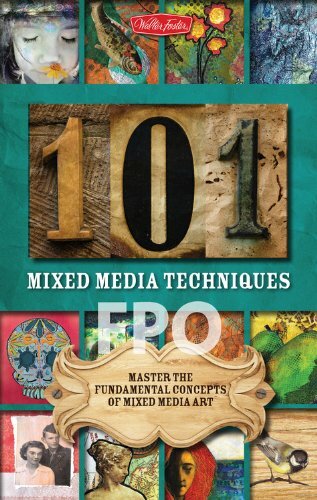 This is a must-have for all new, aspiring art journalists. I have not been able to put it down! I have been so inspired and for this Samantha consider yourself hugged! I can't wait for #2! I loved the personal side of this zine. All to often we admire other artists work, but never really get much of a glimpse into THEM aside from what they post on their blog or websites. Samantha’s zine is honest, raw and unashamed. It shows us that even those whose work we admire are real people too, with the same hopes, fears and dreams. The first issue is still available for order as an e-book here. Pre-orders for #2 open on August 26th! I really miss receiving snail mails. I remember how excited I was to go to my mailbox everyday and check if someone sent me a letter (and I still am, but except bills… we don’t receive lots of personal letters). It’s free (you just have to pay the shipping), and it’s simple: you create something (6×6 maximum) and you write an handwritten encouraging letter to someone that also signed up. And this person will do the same for you. You’ll make someone’s really happy. Also, it was brought to my attention that many of the hard links aren't working on the blog. I changed a setting to hopefully make links shorter, and it's only made things more complicated! I'll be fixing these right away, but if you can't wait, simply replace the httpwwwjournalgirlcom with blog in order to get where you're going. I'd better get set up for tonight's live vlog! Check back here when it's over for the link to the recording. ETA: I still haven't finished this journal page -- I had no idea what I was making! I'll have to take a pic when it's done for you. Hope you learned something nonetheless! I think a lot of this was me playing around with new colors, ideas, and materials. Sometimes, that's how it happens...you have an idea and go to your journal to see how/if it works. I've been into experimenting lately, in such a major way that my studio's more a lab than anything else. I've come out of that cocoon, seen the beauty in my wings, and now have to learn how to fly by, well, throwing myself at the ground and missing. :D This was a fun little project I'm so, so proud of. Who knew I could make pretty like this? + My Art Saves story is up at Crescendoh this week. 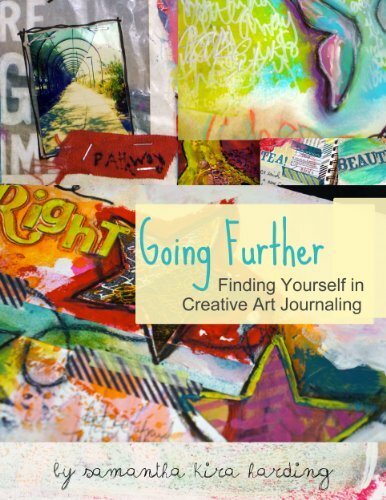 Writing this story was a liberating experience and explains how I got started with art & art journaling. 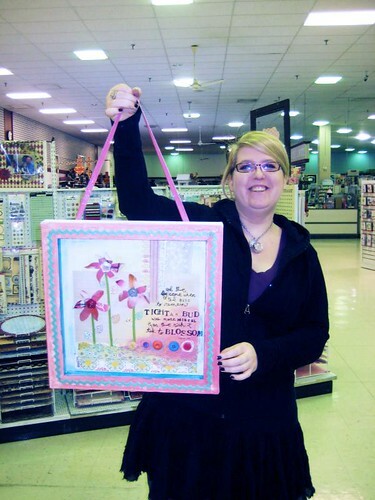 + I'm teaching this Thursday at Hannah's Home Accents in Antioch, IL from 6-9. What, exactly? Read on! + My long-awaited Etsy shop is reopening by the end of the week. 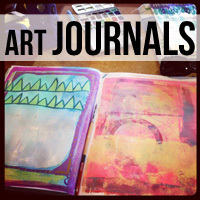 Journals, collage books, jewelry, journaling bits, prints, & paintings! All waiting to find great homes! Have you ever had an idea so clear in your head, you were convinced you’d be able to make it, no problem? That, through your dream, you downloaded the instructions and way to manipulate the material in just the right way? And then, have you sat down with everything, gotten through the easy part, and then everything comes to a screeching halt? When I originally conceived the project and class above, I was convinced I’d be able to make the flowers I wanted, by folding over painted canvas and sewing through a button to the canvas. It would be amazing. And each person I told this idea to was equally excited. Since my studio removes me from the atmosphere and materials available to me in planning a class, I brought only my favorite supplies to the shop to work at one of the workshop tables. There is, in the back of this shop, an amazing little alcove created by a moveable aisle. I compare it to a candy shop. It is the magical place we all wish we had in our closets, our studios: vintage wall paper, ribbon, trim, patterns, every ink pad, mist, paint, stamp you could imagine. Papers and patterns and items and dimension dots and magic. And this is the place I was encouraged to pull from. 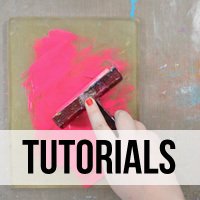 I discovered Glimmer Mists by Tattered Angels and thought, “This is a great alternative to spray paint when you can’t get outside!” Sparkly and colorful, I grabbed a basket of them and went to work, spraying over stencils and papers and bits pulled from the shelves. If you’ve ever worked with spray and stencils, you know how fun this is. And sparkles! Who doesn’t like sparkles! I tried. I did it the way my dream had shown me, and it was too thick to sew through. And then it wasn’t popping off the canvas. I must have sat there with a pile of cut-up canvas for an hour -- I do know I was there much longer than I intended -- trying to figure things out. And if it were for me, I would have moved on, used something else. But this was for others, and it was an idea I really, really, REALLY wanted to create. When this happens, you need to keep going. You need to mutter to yourself, cut different sizes, try new ways of folding or maybe the folds weren’t right at all? 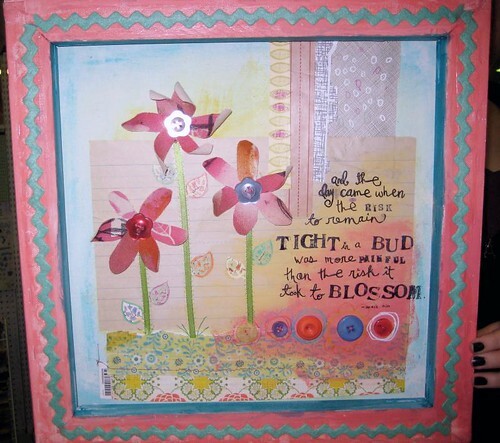 I found cute flower buttons I wanted in the center, and tried with my new petal system to sew throught the canvas. 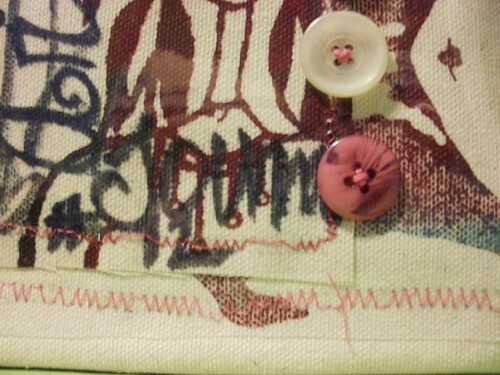 The second flower had the bits taped to the canvas and the button sewn on. Better. But not proper for class. The third flower was created independent of the canvas and sewn together. Then, I knew dimensional dots existed, but where? And searching I went, through clear plastic drawers, to find what would be perfect. Attaching the pre-made flower to the canvas with a dot, I finally achieved what I was looking for -- without even knowing it. Inspired by the beautiful stitched journals by Traci Bautista and all the yummy posts of journals created in Mary Ann's most recent class, I decided to do something a little different for Journal #12. Despite my deep love for spiral journals, making my WISH journal reminded me of the distinct feel of a hard-bound journal...those wonderful pages that turn like an old, loved book, the way you can run your hands clear across two pages....those wonderful attributes that distinguish a hard-bound journal from a spiral. Don't get me wrong, I love my spirals. They're great for curling up with in a comfy chair or in smaller spaces; I often draw up my knees, fold back the journal, and work on a single page. But I wanted to play with something different. I am in love with vinyl. 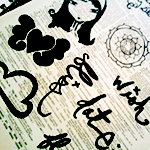 I adore those cute Asian journals with the nice vinyl covers, how it feels under your fingers when you hold them. 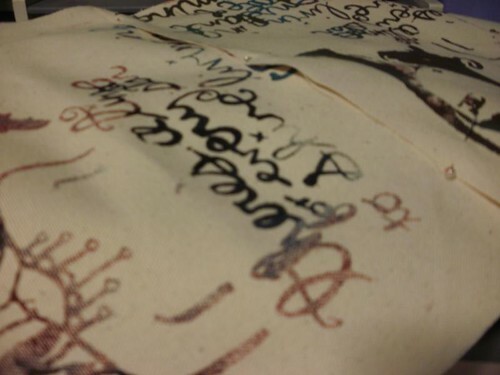 So, after playing with thinner vinyl for the WISH journal, I decided to use a bit of the thicker stuff bought to make another WISH one on #12. And then, of course, there was the canvas. Play is the best way to create art. After two failed attempts to screen print on canvas tote bags, my father and I decided to grab some canvas to test out a. the new squeegee we bought, and b. the amount of pressure and ink needed to successfully print each image (I'll go into everything I've learned about Yudu printing in another post.). So we squirted ink and pulled images and mixed things together. Each panel was a beautiful rainbow of subtle color printing my own artwork and ink writing. There's defiantly a difference between painting directly on canvas and printing on it, just the feel and new realm of possibility. All the colors and places and repetitions. Combining the test print canvas panels, a hard-cover journal, and a temperamental sewing machine, I created Journal #12, the test print journal. I've never really done anything like this before; as I mentioned, my sewing machine is temperamental and the bobbin doesn't really work right. 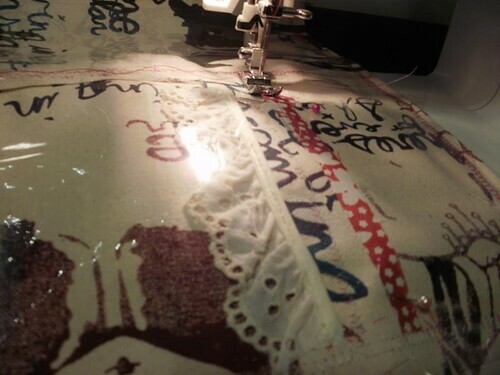 Let's say you sew a straight stitch. Turn the fabric over, and you'll find a huge mess of twisted, looped fabric. I wouldn't sew any clothing or, well, anything that defiantly NEEDS to stay together with it, but playing with fabric for a journal? Sure. This is what you get for $60 at Walmart. There are several theories as to why this happens, the most prevalent being that, not knowing how to load it at first, I took the entire thing out instead of the small bobbin cover. This news taught me how to do it right and earned the machine a few whacks that successfully realigned it...kinda. Suffice to say, whenever I want to sew with the thing, I need to do a few test stitches before using it on my actual piece. Even after stitching for awhile (as it seems to be like my old car in the winter – you've gotta let it warm up a bit before it runs nicely), the thing would skip stitches when using the zig-zag. Which is okay, as this was an artful piece and not perfection. A side note on perfection: it is very hard to let go of this need to make everything perfect, even with meditative art. Sometimes, you just need to let go. I guess I'm like the old car or cheap sewing machine, too, because after working for a bit, I finally warmed up and started to lose myself in the creation of a fabric piece. Much like when I work on collage pieces, I just GO. Grab random pieces, cut strips and blocks, put things together oddly. I somehow bypass that part of my brain that thinks and let creativity flow through me. These last two journal-making experiments have really shown me something new. I find I'm looking at creating journals, that, instead of being vehicles of art contained solely between the covers, I'm seeing the journals as pieces of art in their own right, beautiful creations that only increase their beauty by what I put inside them. I never put much thought into the journals I worked in; now, I find creating beautiful journals on their own is a grand new adventure. I may put some up for sale soon, as I did before the holidays. But long ago I learned that I have to enjoy the pieces I'm making or else, well, I'll never make 'em. I can't just roll out a bunch because I need inventory...I need to let it happen naturally. Then again, with all the fun I'm having, that may happen sooner than I thought. I have always dreamed of developing a postcard set from my artwork. The hardest part, my friends, is picking out what to use! Above is a preview of the new Girls Postcard Set I hope to have available soon. But I need your help -- I already KNOW I love it -- and your opinion. What do you think? Does this seem like a good set? Would you rather see another image here instead? Straight or rounded corners? Soon, I'll show you the first Journal Pages Postcard Set that will be printed at the same time as the Girls one. I've been thinking a lot about this blog, and what I mean to do with it. 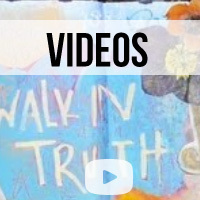 I created this blog to fill a gap I found on the internet -- the lack of blogs about art journaling -- but have found the gap has really, really shrunk. So I'm trying to revise my original vision and aim not only for blogging, but in everything I present. I want to teach! I want to show you all new things! I want to foster budding relationships with journals and this intimiate art form! In revising things, I hope to narrow my focus and bring more captivating and helpful content. I've gotten feedback so far asking for more pages, which I can totally do! But my artistic yearnings are also growing into paintings and printed matter and such, and I'll need to adapt things to fit that. One of the great things that's come from this new postcard project has been sitting down and looking through my Flickr achieves. I originally got the account to post photos from my trip to Japan, and soon put up artwork, so my beginnings can be seen there! Four and a half years of journals. Yes, I've only been doing this that long! And I feel I've only just come out of my shell and created art I love in the last two or three journals. I wanted to show you my journey so you can chart your own and see we all have to start somewhere! I'm back at twitter and will be using the account to get your feedback and send out words of encouragement. More journal pages coming right up, along with a bookbinding video! I have three commissions I'm finishing up and will be filming the process. 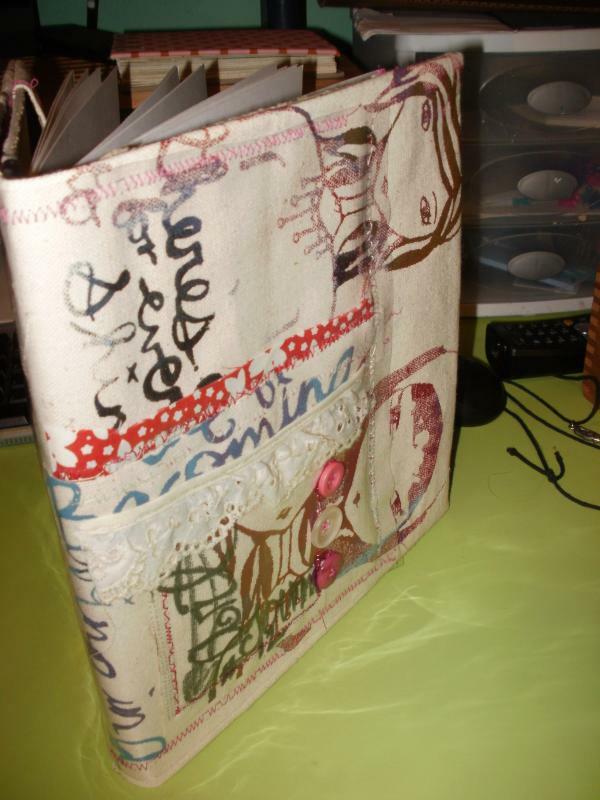 As one is a gift, I still have three slots left for your own custom-made art journal, perfect for the upcoming new year! 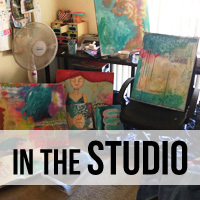 When I began painting outside my journal, I found larger canvases intimidating. I limited myself to the smaller 8"x8" squares or 8"x10" canvas boards. I felt I had no talent, that I was wasting my money buying canvases for paintings that no one would like or buy. There's just too much space! What ever will I fill it with? Seriously! You just work on one corner, then another, and another, and pull it all together. That last part is hard, I have to admit, and I usually seek advice from others on what can be done to finish the piece. But when you do, oh, when you figure out that something that finishes it off....well, that is just golden. An addictive feeling of joy that has me stockpiling canvases in the studio for when inspiration strikes. I usually pull things from my journals, mining those depths for fodder. What have I liked? What was fun? New? Colorful? Spoke to my soul? And onto the canvas it goes. This painting was inspired by a poem I wrote about ants. Yes, ants! They found a crack under the windows at work and snuck in, eating pastry crumbs on the floor. After we "took care of them," I wrote this poem for them. And now, I'm off to enjoy the last day of my August mini-vacation with a hike in the prairie with my journal.